A false engagement. A mysterious coast. Two reluctant hearts. Much to her father’s dismay, Miss Amelia Buxton aspires to become a spinster, just like her eccentric aunt. Growing up with parents who married for every reason but love, she has never seen a joyful marriage. When Amelia requests a summer trip to the legendary waters of Brighton, her father allows her the excursion, but with one requirement: she must return engaged, or agree to the proposal of the man of his choosing. Crawling with tourists, Brighton is not the town Adam Claridge once loved. When his sister Eleanor disappears without warning, Adam is desperate to bring her home. In his search, he happens upon Miss Amelia Buxton, a young tourist that proves vital in his search for Eleanor. But Amelia is conducting a search of her own—a search for a husband—and Adam has little choice but to offer a fair trade: he will play the role of Amelia’s betrothed in exchange for her assistance in finding Eleanor. Convenient at first, Amelia and Adam’s arrangement quickly plummets into disarray. Falling in love had not been part of their bargain. 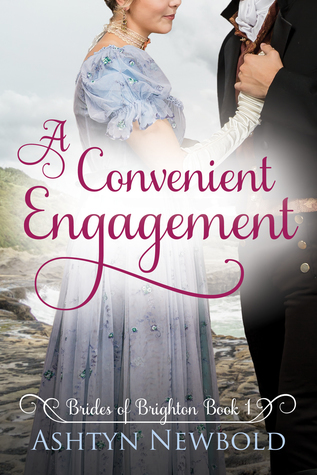 A Convenient Engagement is a sweet and clean regency romance novel. Ashtyn Newbold is a talented author, so I jumped at the opportunity to review her latest novel, A Convenient Engagement. Although this isn't my favorite of her stories, it was an enjoyable read. Dipping was such an interesting thing to learn about. I’ve heard mention of Brighton here and there, but learned much more from this book. The feelings between the main characters came on quite fast, although they did take awhile to let each other know how they felt. They were likable characters, and I appreciated the clean story. I am curious about some of the other characters, and look forward to reading the other books in this series as they are released. I was intrigued by the idea of the cure of Brighton waters. I have read other books about about the waters in Bath, and assumed it was a similar thing, but the bathing machine and the dipper really caught my attention. I had visions of Amelia getting shut into something like a coffin and hauled out to a floating dock where the dipper was waiting. That's probably not how it happened. I should research it more, because I can't get that image out of my head. The story itself felt a little... flat to me. I've read all of Ashtyn's other books and really enjoyed them, so I'm not quite sure why I didn't like this book as much. I just had a hard time connecting with the characters, and therefore, had a hard time losing myself in the story. That being said, since I have enjoyed all of the author's other books, I'm still looking forward to reading the rest of this series when it comes out. This story seemed to go pretty quick. Since I was reading it on the kindle I'm not sure how long the book actually was, but I would guess that it is on the smaller side. It maybe felt really quick because the characters didn't have a lot of depth. Don't get me wrong, Amelia and Adam are great. I just kept wanting more. I wanted more from them and their relationship, I wanted more from Amelia's aunt, I wanted more from...well, everyone involved in the story. I was happy to read that there is going to be more books in this series dealing with everyone, but I didn't feel like it was wrapped up. It ended, just how it should have, but I kept saying, "But what about...". Hopefully those questions get answered in more detail with the next few books. But, all that being said, it was a fast entertaining read, and I will definitely read more from this author. Source: We received e-copies from the author in exchange for an honest review.